HUGH Thomas’s death last month saw the passing of one of the Spanish Civil War’s greatest chroniclers. The historian’s totemic 1961 book on the war was banned by dictator Franco and became an underground staple in Spain. Copies were smuggled across the French border. Anybody caught with one faced jail. Such was the power of Thomas’s words, the simply-titled The Spanish Civil War was described by Professor Paul Preston as ‘the Bible of the Left’. Although Thomas grew to become associated with the Left, his roots were actually firmly in Britain’s establishment. His father was a colonial officer in Ghana, where Thomas spent his childhood, and his uncle the governor at Singapore during Britain’s humiliating Second World War surrender to the Japanese. Thomas went on to study history at Cambridge, where he became Conservative president of the university’s Union. 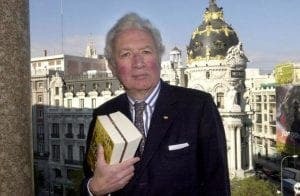 He took a position at the Paris Embassy, resigning in 1957 to start work on the legendary tome, albeit nearly 20 years since the conflict ended. Armed with never-before-seen papers from the German foreign office, diaries from the Italian Count Ciano and parliamentary papers from France Thomas was able to shine much new light on the role of foreign countries in what was ostensibly a domestic conflict. Thomas’s meticulously researched work drew on extensive interviews from participants on on both sides of the Spanish conflict. 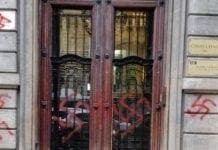 One right-wing Carlist historian assured him the unexploded bomb in his fireplace had been dropped there by ‘the Reds’. He also interviewed Noel Fitzpatrick and Peter Kemp, two of the few Britons who fought alongside Franco’s forces. Of those who fought for the Republicans – among them 4,000 Brits who joined the International Brigades – Thomas interviewed Kitty Wintringham, widow of the British Battalion’s commander Tom Wintringham. The poet Stephen Spender and the Communist reporter Claud Cockburn and George Aitken, former commissar of the XV Brigade were other notable contributors to Thomas’s tome. Beavering away in the Reading Room of London’s British Museum, Thomas pored over books written by left-wing Brigadistas and contemporary journalists. While unable to speak Spanish, he still travelled extensively throughout Spain to undertake research, passing through Madrid, Andalucia, Toledo, Asturias, the Basque Country and on to Barcelona. “I remember how excited I was by the lively avenue, the Rambla, with its flowers and stalls and cafes, and the great statue of Columbus on his column at the end of it, facing the sea,” he wrote of Barcelona. Thomas would go on to meet the Andalucian-based legend Gerald Brenan (he himself the writer of a famous civil war book, the Spanish Labyrinth) in his Churriana home, near Malaga, before the Spanish Civil War was published in1961. It soon became highly sought after in Franco’s Spain, its dissenting voice challenging the regime’s narrative of the conflict. Copies of the book were printed by a group of exiled Spanish Republican refugees at the publisher Ruedo Iberico in Paris before being smuggled across the border. Founded by José Martínez Guerricabeitia, Ruedo Iberico’s printmakers were of varying political allegiance, but united in their implacable opposition to Franco’s regime and hell bent on establishing the truth about the Civil War. One working-class Spaniard caught red-handed with two suitcases of the book at the French border was sentenced to two years for ‘illegal propaganda’ and ‘spreading communism’. Writing in the Guardian, academic Paul Preston commented: “So successful was the book that even Franco himself was regularly asked to comment on statements in it. The Spanish Civil War went on to sell a million copies, with Thomas winning international acclaim. Further books on Cuba, Spanish artist Goya and the Suez Crisis were to cement Thomas’ position as one of the world’s most preeminent historical scholars. The former Labour Party parliamentary candidate was also later to become an unofficial adviser to Margaret Thatcher. Writing five years before his death, Thomas addressed the thorny issue of reconciliation in a country where over 100,000 victims of the war still lie in unmarked graves. “My solution to the problem of the memory of the war is a simple one. A monument should be erected outside Madrid along the lines of the Holocaust Memorial in Israel.